British Animation Awards Competition conducted every two years. The Audies Annual competition for audiobook excellence, sponsored by the Audio Publishers Association (APA). Voice123 Premium Forums A multi-section forum for Premium members of the Voice123 online voice-over marketplace. Bob Bergen's 'Cool Clips' "eh-puh-peh-eh..." The voice of Porky Pig and many, many other cartoon characters, Bob Bergen shares historic - and often hysterical - clips from his career, including his call (at 14 years of age) to his hero, Mel Blanc. Casting Couch Radio Show "The online talk show for everyone in the (media) biz"
How To Break Into The Voice Over Business A video hoot using old-time training film footage with dubbed satire. For any VO at any level, from Marc Graue Voice Over Recording Studios, in LA. 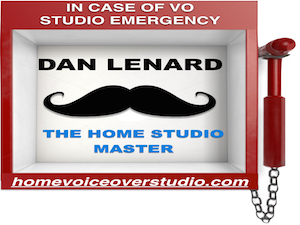 How To Just Get By in the Voice Over Business Take your first class online (if you dare). Instructor: VO talent Robert Jadah ("The Lazy Larynx"). Video production: September Day Leach. Our Infamous Voice Over Movies Hilarious video shorts from Marc Graue Voice Over Recording Studios. Old-time movie footage combines with over-the-top dubbed satire in more than 15 titles, like "Your Voiceover Career", "Your Demo Tape" and "Voice Actor's Studio." Voice Over Studio Outtakes & Bloopers Think you've had a bad day? Listen to these gems, collected by Marc Graue Voice Over Recording Studios, in LA. DigiFon - ISDN Directory Directory of ISDN users worldwide. Web site also offers ISDN set-up and tech info. Microphones Hear them! S.O. Coutant's review of current and classic mics includes sound quality and full specs. Also enjoy the Celebs page with classic photos of celebrities and mics. Sound Ideas Sound Ideas is the world's largest publisher of professional sound effects, royalty-free music, and production element libraries. Spamcheck Before you hit SEND on your next email campaign, run a draft through this system to see if your emails might be considered SPAM. Media Communications Association - International An association of media professionals, with local chapters, for networking, getting business and socializing, worldwide. Society of Voice Arts and Sciences The mission of Society Of Voice Arts And Sciences™ (SOVAS™ ) is to connect job seekers to the consummate sources of training, education, mentoring and employment opportunities required to create and sustain a successful career in the voiceover industry. This is accomplished through the ongoing development and administration of programs featuring educational events, financial scholarships, job placement, meaningful networking opportunities and awards recognition through the Voice Arts™ Award program. Women In Animation Non-profit organization for creative people in animation, including voice actors, animators, production management and writers. North America chapters are in Los Angeles, New York, Chicago, San Francisco and Canada. World-Voices.org (WoVO) The World-Voices Organization (WoVO) is a non-profit, member-driven international association of voice actors. Through chapters and national programs, WoVO works to inform and educate about best practices, standards for ethical conduct and professional expertise. We communicate voice acting's importance to the public and business leaders and affirm the power of professional quality voicing and recording, and inspire through articles, portfolios, recognition of achievement and excellence. We represent and advocate for the profession and stimulate discussion within the industry through events, social media and websites. AudioEloquence Directory of research and pronunciation websites, categorized by topic and language, plus interactive reference works (human voiced) and (last resort) synthesized voice text-to-speech translators. fonetiks.org Free audio pronunciations for vowels and other sounds, in 9 English accents (American, Canadian, British, Irish, Scottish, Welsh, Australian, Indian and South African), plus Spanish, French, French Canadian, German, Swiss German, Italian, Portuguese, Indonesian, Japanese, Mandarin and Thai. Forvo "All the words in the world. Pronounced." Merriam-Webster Dictionary Look up pronunciations and meanings online - including audio pronunciations for words followed by a red audio icon. Free services include lookups in the Dictionary, Thesaurus, Spanish/English, and Medical sections. Say How? A Pronunciation Guide to Names of Public Figures Online project of the National Library Service, based on many thousands of records compiled by voice actor Ray Hagen (http://www.loc.gov/nls/narrators/hagen.html). The ABC Book, A Pronunciation Guide Online dictionary of acronyms, brand names, corporations and more - featuring pronunciation and brief description. Hosted by the National Library Service. YouTube Why not? Search videos to hear how others say the word (but don't get sidetracked). Amador, Rosi Spanish & English: Narration, Commercial, Informational, Music/Misc. Audioline Professional voice-over talent providing voice-overs for jingles and voice-overs for caller-on-hold systems. Bernstein, Janeane Commercials, Animation, Station Imaging. And catch the link to her weekly gig on ChickChat Radio - a nationally syndicated XM satellite show (Fridays, 1 p.m. PST) Channel 155, and the Lifestyle Talk Radio Network. Dodin, Claire English and French demos. English: Medley, Children. French: Commercials, Narrations, IVR/On-Hold, Audiobook, Children & Characters. George, Johnny Commercial, Auto, Character, Retail, Podcast, Games/Videos, Narrative, Marketing On-Hold, Political, Big Brother TV Image. VIDEO: TV spots. Movie Trailer, Web Presentations. Lisa, Mona Minute Montage and spots including TV and Radio Commercials, Audiobooks, Radio IDs/Imaging/Promos, Documentary Narration, Trailers, Corporate and Training Videos, E-Learning, Web and Internet Audio, Podcasts, Telephony, Characters. Sciglimpaglia, Robert Commercials, Narration. VIDEO: TV Commercials. Watson, Rosemary Animation, Kid's Narration, "Madison Avenue Voices," Phone Messages, Narrations, Poem, "That Hillary Show"